The story of our congregation begins in 1838 when traveling Universalist preachers bring their message of universal salvation to settlers in the Iowa City area. Merger with Unitarians begins in 1878, and their combined efforts build an enduring liberal religion in Iowa City that features early female preachers, a broadening of spiritual perspectives, and a deepening commitment to social justice and environmental stewardship. 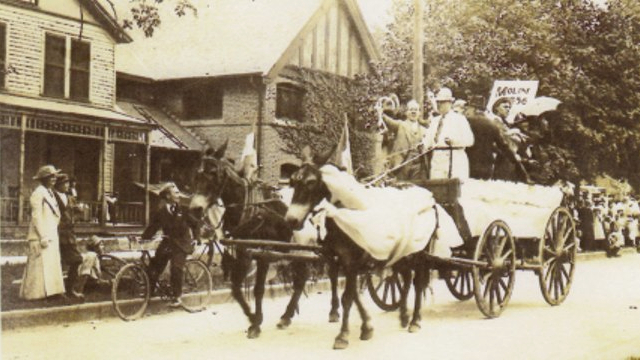 A Labor Day parade passing in front of the church building (the brick structure on the right) that the congregation occupied from 1908 to 2016. Universalists are one of the very few denominations to carry their message to the American frontier. Circuit-riding Universalist preachers, often young women, meet with Iowa City settlers in their homes and find a receptive audience among people who are now free to explore new religious ideas. The First Universalist Church of Iowa City is formally established at the Edward Foster home, and Rev. A.R. Gardiner arrives as the first minister. Gardiner’s petition to preach at the newly-built temporary statehouse in Iowa City is approved over the objections of other religious leaders who also use the shared meeting hall. This resulting publicity leads to what is reported to be the largest audience yet to gather in Johnson County to hear a ’’preaching”. Opposition continues from other Protestant Christian churches. The Presbyterian minister plans to extinguish all the candles at the next Universalist meeting, while the Methodists refuse to meet again in the hall after the Universal!sts have used it. The congregation constructs a small brick church building at the corner of Iowa Avenue and Dubuque Street, funded in part with donations from wealthy Eastern Universalists, including Horace Greeley and P.T. Barnum. First Universalist begins construction of a new building near its existing location, but a fire destroys it before completion. Rev. Augusta Chapin serves as minister beginning in 1869. She is the first woman to earn a doctorate of divinity in the U.S., and the first female settled minister in Iowa City. The congregation thrives despite moving to several temporary locations and hosts a number well-known female suffragists and abolitionists, including Susan B. Anthony, Jane Swisshelm, and Mary Livermore. First Universalist constructs a new building across from the University campus at Clinton Street and Iowa Avenue in 1873, featuring Byzantine architecture and plans for a campanile tower. After Chapin’s departure, the First Universalist congregation dwindles and the building eventually closes. Meanwhile, the First Unitarian Church has become more active in Iowa City following its establishment in 1871. The American Unitarian Association agrees to help support a new minister (Rev. Oscar Clute) if First Universalist will allow regular use of their building. Clute preaches on the controversial topic of evolution and institutes “a vigorous social life,” including dancing, cards, a popular Shakespeare Club, and a youth group dedicated to the study of nature’s religion. Other churches in town and the University of Iowa President are worried about the church’s ideas and influence, and Clute responds by personally inviting each U of I student to attend services. The Unitarian congregation absorbs many Universalist members and the merged congregation becomes the First Unitarian Society of Iowa City in 1881. During the Spanish flu epidemic, which kills an estimated 675,000 Americans, the church serves as an annex to the University of Iowa Hospital (then located in what is now Seashore Hall), providing 3500 meals to health care providers over a three-week period. The Women’s Alliance also makes gauze face masks for children to help slow the spread of infection. Rev. Bill Weir helps found Iowa City’s Community Mental Health Center and participates in the Selma Freedom March. The congregation formally changes its name to Unitarian Universalist Society of Iowa City in 1965, four years after the two denominations merged at the national level. The congregation adopts an “open door policy” that allows building use for activities such as political party functions, arts performances, gay and lesbian dances, and yoga classes. Congregation members begin serving lunch on the second Friday of each month for the Iowa City Free Lunch Program, a practice that continues to the present day. Deepening its existing commitment to including and supporting lesbian, gay, bisexual, and transgender people, the congregation undertakes a two-year process of self examination that leads to a unanimous congregational vote to become a formal UU “Welcoming Congregation.” An Interweave chapter is formed to continue the work of the Welcoming Congregation process. The congregation begins distributing all Sunday service cash donations to local community service organizations, a practice that is still in place. The congregation moves to a newly-constructed building on eight acres of woodlands in Coralville. The building is designed to be the “greenest church in Iowa” and features passive solar design, geothermal and photovoltaic energy, sustainable building materials, on-site handling of water runoff, and inspiring visual connections to nature. During the same year, the congregation is officially certified as a “Green Sanctuary” by the Unitarian Universalist Association, formalizing its commitment to ongoing learning and work related to environmental sustainability.